Throughout the years, many have wonder of what our “first contact” with extraterrestrial life (alien) will be like. Will they be friendly? Will they be hostile? How will they look like? How will the general public regard these celestial beings? Will they understand our language and accept our humanity? Such questions have always been asked amongst the masses from the average “Joe Everyman” to prolithic scientists to powerful world leaders. While Earth has yet to have alien visitors arrive to our planet, Hollywood (over the years) has offered plenty of cinematic sci-fi representation of such an event with feature films, including film adaptations H.G. Well’s War of the Worlds (there’s being several movie adaptations of this), Close Encounters of the Third Kind, District 9, The Day the Earth Stood Still (both the original and remake), and Independence Day just to name a few. Now, Paramount Pictures and director Denis Villeneuve, bring a new spin on mankind’s first encounter with alien beings in the new movie Arrival. Does this film find its linguist message with these foreign visitors or does something get lost in translation? When 12 monolithic alien ships mysterious arrive on Earth, they position themselves around the globe, hovering over different countries, creating fear and panic amongst the masses. Brought to Montana to help Colonel Weber (Forest Whitaker) deal with the possible threat, collegiate linguist Dr. Louise Banks (Amy Adams) is given the daunting task of understanding and communicating with the aliens, eventually to be called Hetapods. Granted an access with two Hetapods every 18 hours, Louise and theoretical physicists Ian Donnelly (Jeremy Renner) are completely taken aback to interact with their foreign visitors, who speak / converse advanced symbiotic ink-based language, making their ultimate reason for arriving on Earth ambiguous and hard to decode. As the day pass, Louise and Ian begin to decipher the Hetapod’s language, learning the basics of communicating with the aliens. Unfortunately, the world leaders begin to their patience with the Hetapod’s presences, fearing that these aliens are here to wipe out humanity. It’s a race against time as Louise and Ian work feverishly to figure out why the aliens are here as Louise battles over a cryptic mind-bending message within her memory, which resurfaces due to her interaction with the Hetapods. As I said above, many have always wondered about alien life and how the scenario of mankind’s first contact will play out. I myself have thought about this from time to time, hoping for the best outcome of such an extraordinary event to occur. However, just as Stephen Hawking’s said “If aliens ever visit us, I think the outcome would be much as when Christopher Columbus first landed in America, which didn’t turn out very well for the Native Americans.”, I have a feeling that such a scenario is a likely outcome. Again…all this is just idle speculation. As for movies, of course, Close Encounter of the Third Kind is always on my personal list (a true classic) on Earth’s first contact with aliens along with the more hostile and blockbuster approach with the film Independence Day (again another classic). There are other ones out there, but those two are my favorite. However, I might have to add another movie to that list as Arrival takes a more “highbrow” scientific approach to meeting extraterrestrials that compliments itself well with strong performances and compelling drama. Interestingly, Arrival is actually adapted from the short story “Story of Your Life” by Ted Chiang and is directed Denis Villeneuve, who previous directorial work includes Prisoners, Enemy, and Sicario. The film’s script (adapted and penned by Eric Heisserer) translates Chiang’s material beautifully on-screen, telling a very complex and moving narrative from start to finish. Villeneuve’s style in filmmaking is applied in Arrival, keeping a lot of the film’s overall mystery “close to the chest” for much of its run, which makes viewers (me personally) engaged to see how the film’s ending comes together. 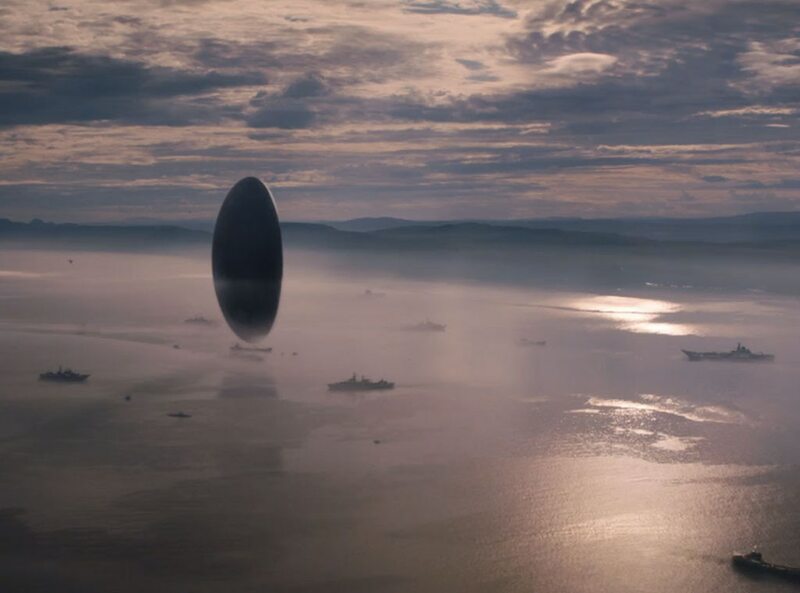 Another reason why Arrival works so well is the whole mystery behind why the Hetapods are here and also how they looks like. I’m going to spoil it, but they look kind of interesting. In addition, beyond the whole sci-fi element of an alien encounter, Arrival paints a very emotionally moving tale through the eyes of Louise Banks (via memory flashes) as we (the viewer) follow her journey through the memory fragments to decode the meaning behind them as well cracking the Hetapods ink language system. Arrival is a more sophisticated sci-fi tale of Earth’s “first contact” with aliens, a more cerebral undertaking with their interaction with these otherworldly beings as well as in the film’s main character (Louise) in her own personal journey. That being said, the movie is a slow burner and a bit of a departure of the pre-conceive notion that many viewers were probably expecting. Arrival isn’t a sci-fi movie of blockbuster fanfare, so don’t expect to see zooming spaceships, big aerial dogfights, and explosive destruction. Overall, the film is well-made from camera angles and shots to set layouts and costume appropriate apparel. The film’s visuals are also pretty slick, seeing the large monolithic alien ship towering above the landscape or the creative design of the Hetapods. As a side note, the film’s score (composed by Jóhann Jóhannsson) is great, providing enough subtle yet haunting melodies that add to the whole ambiguous ambiances of the feature. There are bumps (hiccups) that I found in Arrival to be my points of criticism. First, the movie can be a bit confusing at times. For the most part, I was able to follow the film’s narrative, but there were a couple of moments, especially a bit towards the second half, that I felt a bit perplexed by what was going on or what Villeneuve wanted to convey in the movie. It’s nothing like baffling quantum theories and scientific technobabble from Nolan’s Interstellar, but there are a few mind-boggling scenes that may have you scratching your head after seeing the movie. Another negative criticism is that the film sort of glossies over how Dr. Banks and Ian break the code to talk to the alien Heptapods. Villeneuve presents a scene on how the many steps that Dr. Banks must take to get the answer to their ultimate question (i.e. Why are you here? ), but how she learned to decipher, despite given a slight explanation on how they “cracked it”, is sort left hanging in the air as a you (the viewer) simply have to accepted the finding (fuzzy as it is) to help comprehend the rest of the film. Perhaps the most interesting aspect of Arrival is to see the evolution Louise’s journey, naturally playing a part of main story thread involving the alien visitors, but also in her own insight into her character. While Villeneuve guidance helps, actress Amy Adams is the crucial component in selling the character of Dr. Louise Banks. At first, it’s hard to see Adams playing such a serious role (i.e. a character that is broken, conflicted, determined, and compassionate), but she definitely turns a terrific and strong performance. Personally, I’ll always see Adams as the headstrong news journalist Louis Lane from recent DCEU movies (Man of Steel and Batman v Superman: Dawn of Justice) or as the whimsical princess Giselle from Disney’s Enchanted. However, that might change as now I add her role of Louise to that list. Following Adams, Arrival gives a central spotlight on actor Jeremy Renner, who plays Ian Donnelly. Renner, mostly known for his roles in The Hurt Locker, The Town, and the several stints as Clint Barton / Hawkeye in the MCU movies (Thor, The Avengers, Avengers: Age of Ultron, and Captain America: Civil War) brings the right amount of wit, charm, and confidence to the role of Ian as well the various scientific outlook in his character (a theoretical physicist) and in their current situation. With much of the focus placed on Adam’s Louise, which then followed by Renner’s Ian, Arrival doesn’t really have a huge sprawling supporting players. However, a large ensemble cast of noteworthy side characters isn’t require for a film like this as Villeneuve focuses more intention on his two primary characters with a handful of supporting ones. The one minor character worth noting the most is actor Forest Whitaker as Colonel Weber. It’s not really stretch for Whitaker to play, but the Oscar-winner projects the perfect amount of gravitas and nonsense sensibilities to the character of Weber, working well for the character and actor who have some experience under their belt. Rounding out this small ensemble grouping are Michael Stuhlbarg as CIA operative Agent Halpern and Tzi Ma as General Shang. It should be noted that both Stuhlbarg and Ma’s roles, while not quite rounded roles, are essential to the film’s overall narrative. Who are they? Why are they here? These are the fundamental questions asked in the new movie Arrival. Director Denis Villeneuve newest film is a smart tale of mankind’s first contact with aliens that boast a sophisticated narrative and nuances, great visuals, and strong performances from its small but effective ensemble cast. There are some minor criticisms in the movie, but most of those can be overlooked as the film still retains a very cerebral approach to the sci-fi genre, one that takes a very intellect style versus the conventional of blockbuster action fanfare as well as blending in emotional human drama. Personally, I really liked this movie. Yes, there are some minor discrepancies that I have with it, but Arrival was smart, sophisticated, and quite intriguing. I would definitely highly recommend this movie, especially those who liked Villeneuve’s movie (i.e. Sicario) or last year’s hidden sci-fi gem Ex Machina. If you’re looking for something different from the current movie lineup (and still disappointed by the disappointment of Independence Day: Resurgence) then check out Arrival, it’s worth the time (and money) and is one of the better mainstream sci-fi movies of recent Hollywood features. Wow! You had a lot to say. As you may have read from my review, I didn’t like it. Oops, hit enter before I was done. I think the text material probably focused on the logographic nature of alien language. This means one character is one signifiers (word). In Western culture we have alphabet systems which, in theory, nurture a different view of reality. It was as if Villanueva felt he could shock and awe audiences with this. Plus, it had more to do with the concept “If you had the agony and ecstasy to do all again, knowing the tragic outcome would you?” I found that very cliche and to me the aliens were just a prop to sell tickets. Thanks for the comment! Yeah, I understand your reasons behind your dislike of this movie. This one of the movies that can have a very wide range of opinions (whether good, bad, or indifferent). Yes. I was entertained but I wanted to give my true feelings on it. I think it’s scored too high with the critics. No worries. Everyone is entitled to their own opinion. I mean the movie wasn’t perfect (that’s why I gave it a 4.3 out of 5), but it was more sophisticated than most movies I’ve seeing this year. I can’t speak for other reviewers / critics about this movie, but maybe I liked it because I didn’t have huge expectations for Arrival, which is why I liked it a lot. Yeah, its getting a bunch of rave reviews for it. Some might like it, some not so much. I would be curious to know what you think of it…if you see it. Thanks for the comment! I can relate to your feelings about Amy Adams before seeing Arrival. This one truly solidified her talent in my eyes- she is a serious actress indeed. Good review! Definitely. Arrival should a different layer Adam’s acting ability. Thanks for the comment! I saw the movie in Bengaluru/India and understood differently and as follows. This movie operates in multi-levels and provides Gravity / Interstellar level or better movie experience. It is full of symbols and hidden messages. At the out-set, it starts where Steven Spielberg’ path breaking movie “Close encounter of the third kind” ends. Apparently, it addresses challenge of communication between two widely different worlds/planets. But in reality, those worlds could be our world and our parents world. Like parents think they know past, present and possible future world of their children and want to gift (especially the future) that to children and similarly children wants to understand what their parents are and what they are trying to communicate, in the movie, aliens arrive and want to gift their understanding of time to humanity and seek help from them later. How humans and aliens resolve communication challenges, forms the plot and it is narrated in a gripping way! In fact, movie is trying to probe communication gaps between generations and trying to offer solutions for mutual benefits. Aliens arrival is just cover-up to reach out to all generations. We should appreciate tenacity of the original writer and director for this. Movie will get many Oscars including Best Director and Female actor for Amy Adams. Go watch it with your children and parents. Worth an effort and expenditure.